Steve Ince joined Revolution few years after its foundation and stayed at the company of Charles Cecil for eleven years, up to its dissolution. 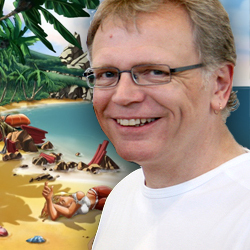 So Blonde: Forgotten Island is his first adventure game since Broken Sword 3: The Sleeping Dragon . Aventura y CÍA: Since you left Revolution you have tried to find your place in the genre, to carve out a path for yourself. How do you feel now that you are head of a whole project again? Steve Ince: Well, I’m not sure if I’d call it “head” but, certainly, I did the story and the design script for So Blonde . It’s rather exciting, really, to be in this position because it’s so difficult these days to get into projects where you have quite a lot of creative freedom. But, at the same time, I’m really impressed with the team, the guys at Wizarbox, who put the game together over in Paris. They’re really talented people who worked very hard for the last year, because they’ve put the whole game together in less than a year; it’s very near to completion now. From very early stages to where we are now… it’s a lot of work in a relatively short time. In some respects I’m a kind of public face of the game. But the game couldn’t happen without the talent of the whole team, really, because they’re just so good. The surprising thing is that this is their first original title so the fact that they managed to do this in a year is wonderful, and it’s great to work with people who are very dedicated professionals. It’s kind of what we all dream of doing – to work on exciting projects with different talents. The backgrounds are wonderful, the characters are nicely drawn, the concepts are excellent, so I’ve used that as a basis to create the story and the game design. It’s been a lot of fun and hopefully that fun comes too to the players when they play. AyC: So Blonde is about a posh girl lost in a pirate island. What were your influences at the time of conceiving and developing the story? SI: I think that it has a lot in it that’s not just from games, but from films and other stories and the like. And primarily what I wanted to do was to create something the player could have a lot of fun with, in terms of having a story that he or she could get into, and the gameplay and the story can interweave with each other. Because I worked for Revolution for so long there was a lot of influences from working the Broken Sword games, Beneath a Steel Sky , In Cold Blood … all those kind of have an influence in the way that I approach the design or the development of those games but I try to apply the principles in a fresh way, particularly as this is much more of a comedy game than those Revolution games were. Although there was humour in the Revolution games, they weren’t designed as comedy games primarily. Also I like to look back to some the classic games as well, to things like Monkey Island , Grim Fandango , all these kinds of games. They’re not a direct influence but all feed into the mix to give it an overall feel of delivering to the player a sense of enjoyment when you play. Many of those games weren’t heavily serious and stuff like that… so that’s kind of where the influence is coming. AyC: The story of So Blonde leaves the door open for the parody, so up to what point are you exploiting that? SI: It would be very easy to do the game which was just about Sunny’s shallow nature if you like, you know, the way she starts off the game. She’s very superficial, she needs her make up, she’s into clothes, all she can think about is finding a phone to contact her friend because she wants to learn the latest gossip and all those kinds of things… Now, suddenly, she’s thrown into this environment where she’s having to fend for herself, she’s having to think for herself; the situation pulls something out of her that she didn’t know was there. It’s not so much about changing her, as finding something from within, so she grows from within, she finds things that make her more resourceful, that make her overcome all the obstacles that are in her way. Part of the game is discovering the problem that the islanders face and she works towards resolving that problem, and working with the island to do so. The player, because Sunny is in this unknown world effectively, the player kind of explores the world with Sunny, and also it’s a kind of exploration of Sunny herself, as well as the exploration of the island. It’s kind of a double learning process if you like, and that’s one of the strengths of it – we take this very shallow character and build in her into something much deeper and richer. AyC: But there would be acid humour, or…? SI: Well, there’s a lot of humour in it, I mean, we make fun of the fact that she’s a blonde and there are still a few blonde moments throughout, so she’s not… she doesn’t let it go entirely. What she’s doing is embracing a newness within what she is, and she’s not a completely different character although she has new qualities, much more endearing qualities. AyC: Aha. Graphical aspects remind us quite a lot of the Runaway series, by Pendulo. Why is that you have chosen this particular style? SI: Well, when I got involved in the project there was some concept art already done for the characters and for the locations, so the style was chosen by Wizarbox, but what I’m doing is taking that style and building on it to create locations with lots of details, lots of feeling and we’ve been able to put in lots of interaction detail – you know, examining a lot of background things. Sometimes it can be silly little hidden things or more blatant objects, but there are some that are a bit of a homage to other adventure games, such as a homage to Broken Sword and there’s another one to Monkey Island . It’s an extra bit of fun for the player, but the quality of the art just helps create that fun feeling as well – a kind of rich quality the old games used to have. Monkey Island games and the old Sierra games – all those hand-painted backgrounds that we used to enjoy, it’s kind of taking some of that and bringing it up to date in the same way that Runaway obviously did. That game took the hand-drawn style and really worked it to be a really strong feature of the game. When you create a game of this style I think it helps having backgrounds that support that style. AyC: You have worked with both 3D and 2D. What are the differences between the game designs for the two techniques? SI: The biggest difference I think is the way you approach the design. When you know if it’s full 3D you can build things that are more exploratory. If you have a camera follow a character around the corner, you’re exploring the alleys, you’re exploring the setting and so on. But when you’re doing it in 2D you’ve got this kind of static image so you think of puzzles in a slightly different way, the interaction with the backgrounds is slightly different. Things like conversations and inventory can still be approached in a very similar way because it’s something that doesn’t really rely on the 3D or the 2D nature. In a game like So Blonde with 2D backgrounds and 3D characters, it’s really a 2D game because the backgrounds are the primary force and you don’t move the camera through them anyway. If you have a 3D game you are most likely to control the character more directly, but when you got a 2D game, point and click seems so much more natural and things like that can affect how you approach the actual design.